When we left Tierp in June we couldn’t imagine that we would be back here in August. After the crash we thought that the season was over for us. But with a lot of hard work and help from several people the body and the chassis were repaired and the car received a new paint. In Hockenheim it was not possible to test our new chutes: the speed wasn’t high enough and the eliminations were cancelled so we had to go to Tierp not knowing if the chutes would work this time. On Friday the weather was nice and Danny could start the qualifications with a solo run. 6.23 sec. - 304 km/h but Danny got off the throttle just past half track. In the second pass of the day the motor stopped right after the launch. Back at the trailer we found out that the throttle linkage came off. In the 3th qualifying session on Saturday Danny put a time of 5.82 sec. on the boards. Each run the chutes came out and deployed like they should, this builds confidence again. In the last qualifying run Danny hit shake and pedalled for a brief moment. No improvement, we ended up as 4th qualifier. On Sunday morning it started to rain and it continued to drizzle till noon. After drying the track, eliminations could start. In the first round we were up against Micke Larsson. Danny with 5.90 sec. and 404 km/h trough to the semi-finals against Leif Andréasson. This was the first time that the car reached a speed above 400 km/h and still the chutes deployed perfectly. 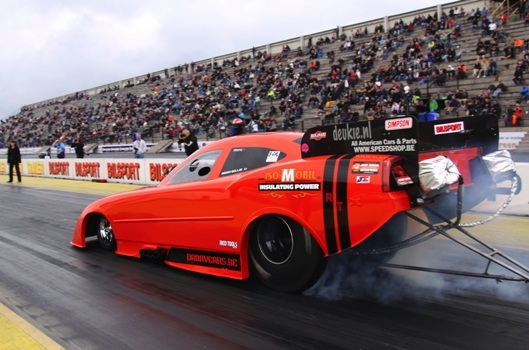 In the next round Leif had the better reaction and Danny’s funny car started to move towards the center line. With a 5.83 sec. Danny lost this round to Leif’s 5.60 sec. After the semi-finals it started raining again and so the race director finally had to call the event. Still a second place in the European Championship and next week we will be running the Finals at Santa Pod. We would like to thank Dan Larsen and his team for repairing the body. Also many thanks to autoschadebedrijf Harteveld.nl and Deukie.nl. And finally we thank our sponsors Iso-Mobile, Rico Tools, Marcover and Speedshop Belgium for their support.